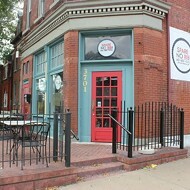 2212 South Jefferson Avenue; 314-833-0085. Mon.-Tues. 8 a.m.-5 p.m.; Thurs.-Fri. 8 a.m.-5 p.m.; Sat.-Sun. 10 a.m.-4 p.m. (Closed Wednesdays). You might be tempted to write off Milque Toast Bar as merely a Midwest outpost of an eye-roll-inducing San Francisco trend, the artisanal toast shop, or, as a restaurant manager in the City by the Bay put it, "the tip of the hipster spear." You might even view the concept with contempt: the embodiment of our culture's food fetishism, the one percent's encroachment on humble breakfast fare. Five dollars for a piece of buttered toast "handcrafted" by a flannel-clad fella? What have we become? Then you bite into Milque Toast Bar's blue-cheese melt, and you get it. Man, do you get it. A half-inch layer of luscious blue cheese blankets a single piece of thick-cut pumpernickel. There's much more to the topping than the funky cheese, though. 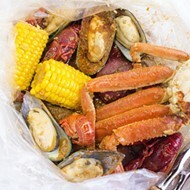 Louisiana hot sauce induces a mouth-puckering tang, and generous white pepper lingers as warm, back-palate heat. The concoction is softened by a flash in the oven, giving it a tawny, slightly caramelized color. For a humble cheese spread on toasted bread, it is shockingly complex. The same can be said about Milque Toast Bar. 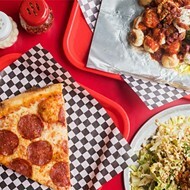 On the surface, owners Colleen Clawson, Rachel Moeller and Amanda Geimer have created a low-key neighborhood café -- the name is a play on both the simple, old-timey breakfast food and the early-twentieth-century comic strip character Casper Milquetoast, who was known for his meek and timid constitution. The storefront on South Jefferson Avenue. Their tiny digs certainly bespeak humility. The vintage-decorated shotgun storefront has only four small tables fashioned into one large communal strip of seating with mismatched chairs and a handful of stools along a narrow ledge. The kitchen takes up the majority of the space, but even it isn't a large set-up. There is no full-size oven, no range, and only a small, dorm-room-sized reach-in cooler (the owners use a slightly larger refrigerator on the back patio for overflow). All the cooking is done on two convection burners and two small pizza ovens that are barely more sophisticated than the set-up you'd take camping. Underneath this simplicity, however, is some serious culinary firepower. All three owners have worked in some of the city's most notable kitchens. Two (Clawson and Moeller) even boast résumés that include time spent working under James Beard-recognized chefs — Clawson for Kevin Nashan at Sidney Street Café and Moeller for Dallas' Stephan Pyles. 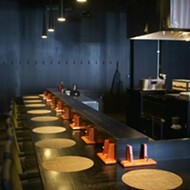 Among the three, they have roughly fifty years of restaurant experience, most of it in fine dining. 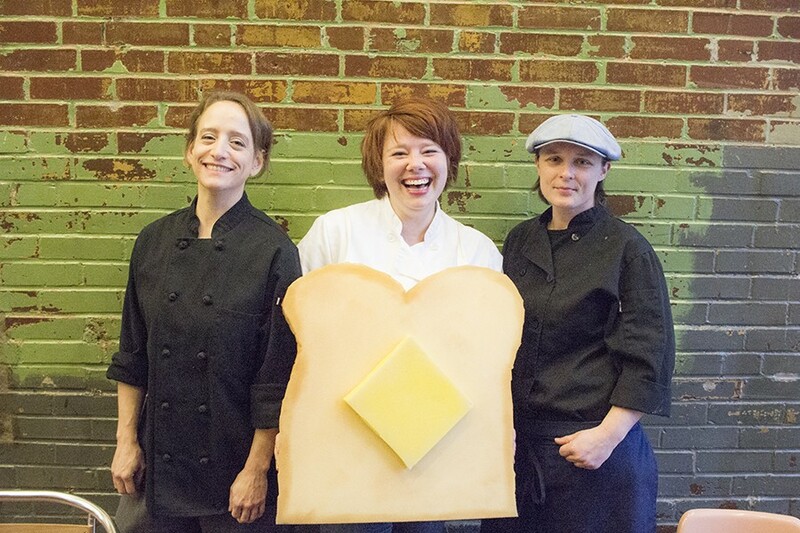 Their background is what allows Milque Toast to transcend the toast bar trend to become a bona fide artisanal sandwich cafe — albeit one that only serves its wares open-faced. Clawson, whose McKinley Heights home looks directly into Milque Toast's back yard, came up with the concept through free association. She and Moeller were chatting one day about what they could do with the space, but were less than enthusiastic about its overgrown yard. Clawson off-handedly mentioned they should get a goat, then started talking about goat milk and eventually mused about what they could pair with the milk. Food was only part of the equation, though. Clawson wanted to create a neighborhood gathering place — somewhere to grab a cup of coffee and a wholesome meal during the daytime. 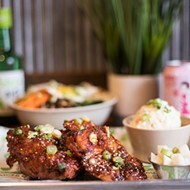 That vision is realized in the form of a thoughtful menu that runs the gamut between on-trend simple offerings and the more complex "Spiffy Toasts." Cinnamon sugar toast, the beloved snack of everyone's inner kindergartner, is an elevated taste of nostalgia. A thick slice of white bread is soaked with melted butter and encrusted with a cinnamon-sugar shell. The effect is like French toast without the egg, yet just as decadent. 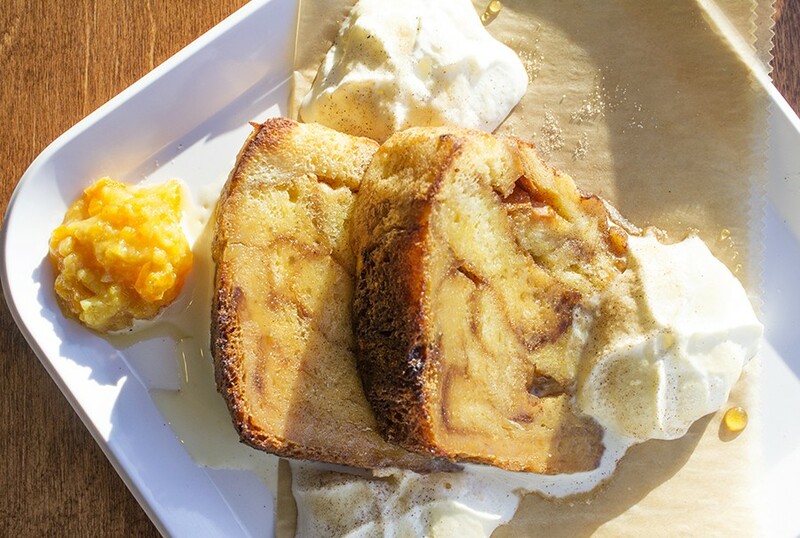 The restaurant's namesake dish is Crock-Pot vanilla bread pudding, drizzled with maple syrup, dusted with cinnamon and garnished with whipped cream. This is a far more sophisticated preparation than old-fashioned milk toast — though, to borrow from M.F.K. Fisher, it is just as "warm, mild, soothing and full of innocent strength." 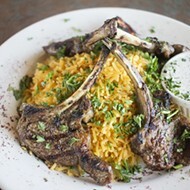 It's no wonder that this dish was once thought of as restorative. Clawson's six-year-old son is the inspiration behind the "Nutty S'Mores" toast, which explains the childlike joy this treat induces. The Nutella-slathered toast, topped with brûléed marshmallows, has all of the backyard whimsy of the kind you make with graham crackers, minus the over-charred bitterness that comes from the unavoidably scorched sugar confections. Milque Toast's version is proof that even campfire classics are best left to the professionals. The savory offerings are where the Milque Toast team shows its culinary chops. Exotic mushrooms and a herbed local goat cheese with truffles crown rustic wheat bread for a classic, earthy pairing. 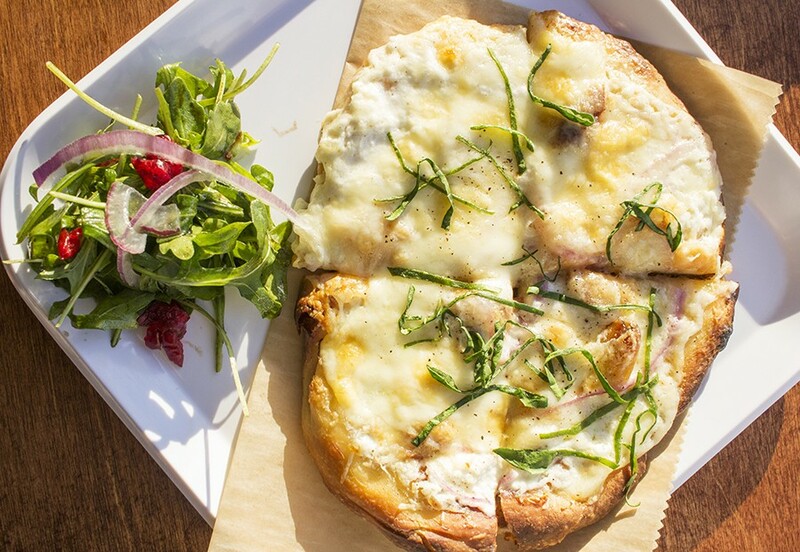 The "Pizza Bianco" begins with a small pizzette shell from Red Guitar Bread, simply topped with olive oil, herbs and Parmesan and fontina cheese. The taste occupies a glorious space somewhere between cheese garlic bread and a toasty Cheez-It. 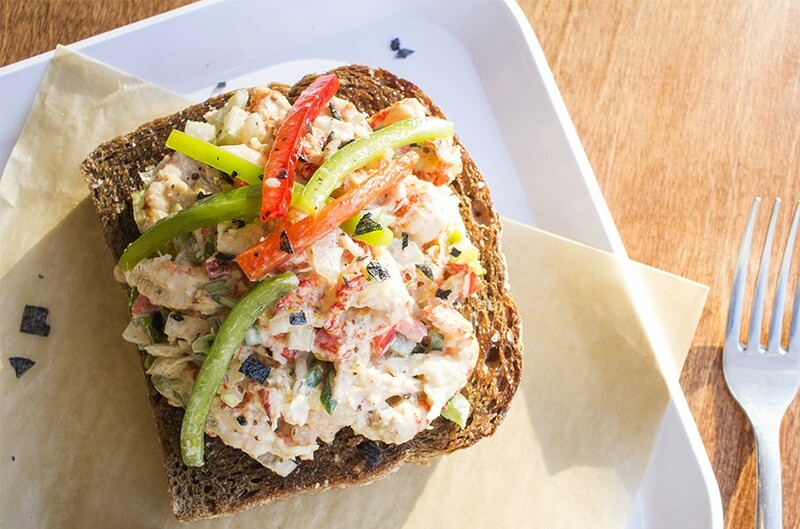 The crawfish toast, one of the many off-menu specials during my visits, reads like a Cajun-style seafood salad. The tiny crustaceans are liberally tossed in tarragon-flecked remoulade and served atop pumpernickel for one of the restaurant's heartier offerings. Another special item, the "Chicken and Gravy," evokes Thanksgiving biscuits and gravy. Large hunks of pulled chicken, simmered in peppery thyme pan gravy, smother a thick slice of whole-grain bread. It's like Grandma's Sunday supper on toast. Milque Toast serves two soups each day, playfully named "George & Martha" after the children's book series. On my visits, I sampled a well-executed mushroom and kale that walked a perfect consistency between broth and cream. But the standout that day was the second soup, the sweet potato and chipotle. The pepper's smoky heat — they weren't shy about the spice level — balanced the root vegetable's sweetness. Accents of cinnamon and nutmeg rounded out the seasoning for an overall warming effect. 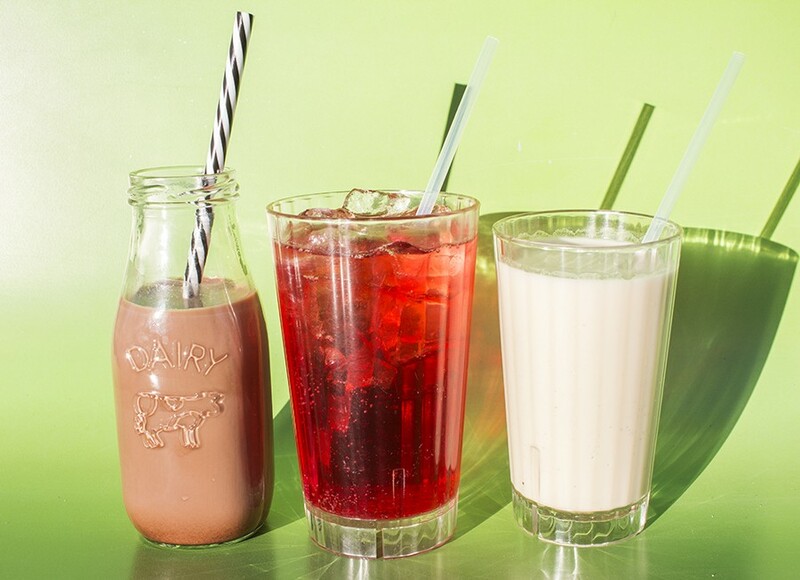 The "Malted Milk Ball," "Jamaica Fizz" and cashew milk with ginger-chai syrup. 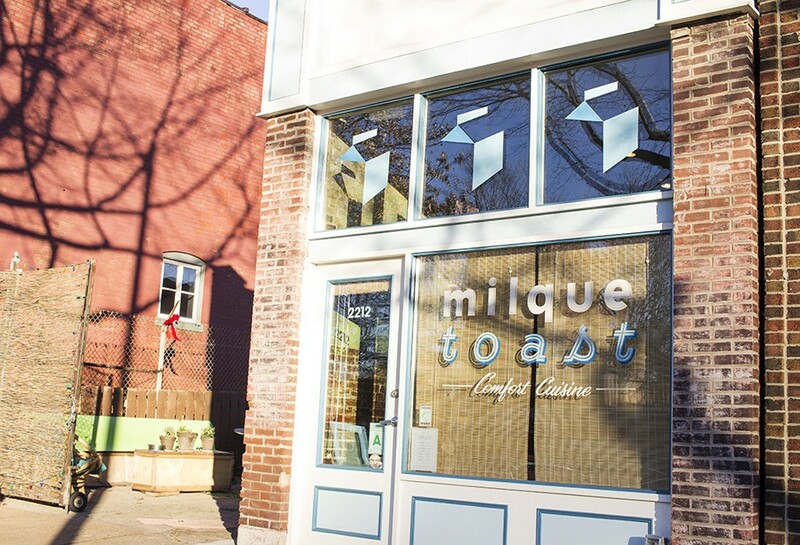 As its name suggests, toast is only part of Milque Toast's story. The restaurant offers local milk as well as housemade cashew, coconut and almond milks served on their own or as bases for a series of rotating drink specials. The strawberry-shortcake fizz, made from housemade strawberry syrup, local cream and seltzer, is a drinkable dessert straight out of an old-fashioned soda fountain. The taste of the season, however, is the coconut eggnog, or "Christmas in Hawaii." The drink is dairy-free — until you add a mountain of luxurious, freshly whipped cream to the top at Geimer's urging. That's Milque Toast — a place you go into for a simple slice of buttered bread but walk out dazzled by everything that gets piled on top. Pay no attention to the name. There is nothing timid about this gem.